I can’t remember an employment law story causing this much of a row since the 1980s. Whatever else you might say about Adrian Beecroft, at least he’s got us discussing the subject and, as Michael says, he’s inspired some great blogging as well. It was inevitable that, at some point, Beecroft’s defenders would bring up India and China. The argument goes like this: Never mind that Britain has the lowest level of employment protection in the EU and among the lowest in the OECD, it is the BRICs we need to compete with now. I’ve seen this trotted out in a number of interviews and comments threads over the last few days. You are probably sick of me posting this graph by now but look at it again, closely. 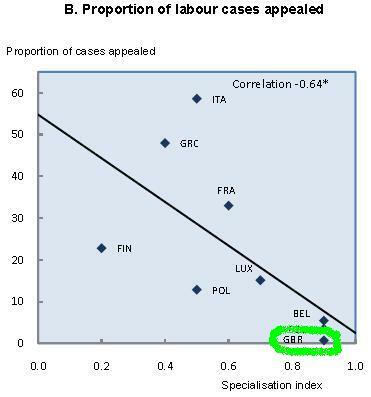 As the title says, it shows employment protection levels in the OECD and other selected countries. Towards the right, the highly regulated end, you will find India, Indonesia, Mexico and China. In the middle you will find Brazil. All those countries which are set to overtake us by 2050 have higher levels of employment protection than we do. Of course, it’s not just the law that causes headaches for employers, the legal process can be burdensome too. 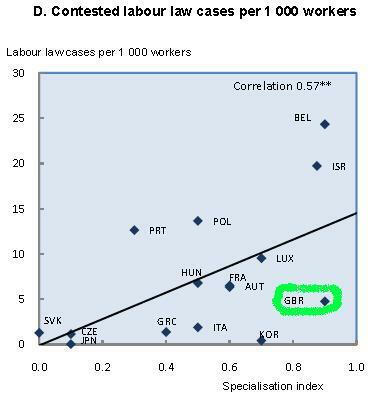 Here too, though, the UK compares favourably with other countries. 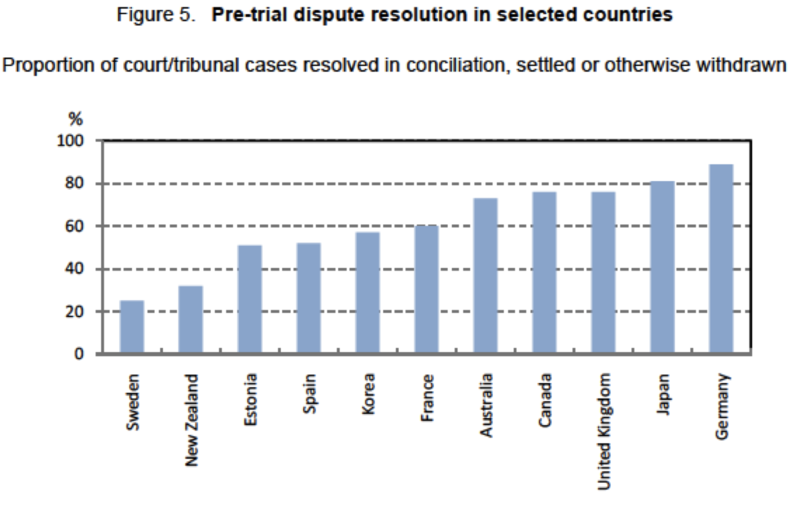 Compared to some of the other countries studied, the UK has relatively few contested cases and relatively few that go through a number of appeal stages. Our system is also reasonably good at keeping employment law cases out of the courts in the first place. In the event that a dismissal is found to be unfair, the court may reinstate the worker with or without back pay. In extreme cases where the employer argues strongly against reinstatement, the court may award compensation instead of reinstatement. Labour courts typically take 3-4 years to settle disputes and make an award. One important observation – Indian Labour and Employment Law is among the most complex in the world. The Chinese system is a contract employment system. This means all employees must be engaged pursuant to a written employment contract and during the term of that contract, it is very difficult to terminate an employee. An employee can only be terminated for cause and cause must be clearly proved. This means the employer must maintain a detailed set of rules and regulations and must maintain careful discipline records to be able to establish grounds for dismissal. This whole situation makes the employment relationship and the employment documents much more adversarial than is customary in the U.S.
And yes, Quentin Letts, they do have maternity leave in India and China. Every major economy in the world has employment legislation and, in general, both the law and the legal processes are more onerous for employers than they are in the UK. Before we reduce our employment protection even further we need good evidence that it would make a significant difference to our economy. So far, all Beecroft and his allies come up with is spurious anecdotes and scaremongering about the threat of competition from the BRICS. Well even the BRICS have more employment protection than we do. If our only strategy for growth is to beat up on employees more than they do in India and China then the government has clearly run out of straws to clutch. Capital will always argue against the interests of labour because labour is the source of profit for capital. Rights granted to by labour by the legislature restrain capital and the latter’s quest to extract maximum surplus value from labour. Labour and capital are in opposition to each other and hence it comes as no surprise that Beecroft, who is merely promoting the interests of his class, should wish to strip labour of its rights, however meagre these rights may be relative to those enjoyed by labour in other countries.. Beecroft’s report is simply a manifestation of the class struggle. The best comment I head on the Beecroft Report was on Friday’s News Quiz (satirical comedy programe on BBC Radio 4 for those who don’t know) – employers in the UK have not been happy since the 1800’s when William Wilbeforce and Co forced them to pay their employees. Employment law will be better implemented in Britain than elsewhere. In lots of countries their employment law is only nominal. Either local officials are too incompetent or too corrupt to do enforce it. Particularly true in China (at least the last time I studied employment in China about 3/4 years ago), the institutions to back up formal rights were seriously underfunded. It was standard practice to withold pay and to dole it out in arrears to help maintain discipline for example. The right wing response would be that although formally Britain has little employment protection, it is actually used by employees and worried about by employers. Which is a criticism which has some weight vis a vis developing countries. I suspect Beecroft is expressing a major frustration with setting up new and profitable businesses. The thought is ‘if only the workers were cheaper etc’. Wrong target – globalisation impacts severely the choice of businesses one can profitably set up in the UK – car making is still profitable, making IPads is not. At the margin a few operations are returning to the UK due to transport and labour cost movements but contribute very little to our economy. So what determines a successful economy? Land area and natural resources seem solid benefits but low labour costs and a usefully skilled population seem ephemeral in the longer term – given another 20 years and the German machine tool advantage will likely shift east and aero engine making similarly. Ulimately the market flattens out for every worker everywhere. This. Absolutely correct insofar as Russia is concerned. Their employment law is absolutely rock-solid behind the rights of the worker, makes most people impossible to sack. For instance, you cannot dismiss somebody for gross negligence (for example, being hammered whilst driving a forklift) unless he has done exactly the same offence before and you warned him for it. Any foreign company trying to dismiss somebody without seriously having their house in order will likely lose the inevitable court case. However, a Russian company will just tell their employee that all their salary must now be taken as bonus, subject to the manager’s discretion. If they want rid of you, they just stop paying the bonus, i.e. the whole salary (minimum wage laws are ignored). Some don’t even bother to do this, just tell you to leave and not come back. Courts in Russia can be bought pretty easily, unless of course there is a foreign company to be bashed. And is Russia a richer country for having such a lax employment protection regime?